How to Cancel a HostGator Package - Affiliate Resources, Inc.
Have you ever wanted to cancel something within HostGator and found that you ended up getting the run around with their support docs? In this post, I am going to show you how to cancel a HostGator package as I had to do this recently and I will reveal how easy it was. One of the great things I like about HostGator is that you pay for their hosting on an annual basis so that you don’t need to worry about the hosting cost every month. This is ideal if you’re just starting out in the world of online marketing as you want to focus entirely on growing your business instead of worrying about business costs. Recently I decided to merge all my hosting onto Wealthy Affiliate as they now offer hosting within their membership. I’ll discuss how awesome their hosting is another time, but for now – let’s go through the motions of cancelling with HostGator. I have several packages with HostGator and one of the first packages I ordered was their Baby Plan for my affiliate sites. This was several years ago and I have always been very happy with their service. But since I have more than one hosting package with them, I wanted to ensure that I request to cancel the right one. 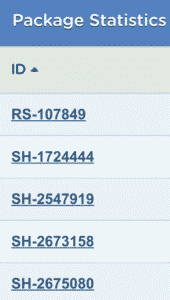 Within your customer portal, you will see at the bottom a summary of all the packages that you have and the corresponding ID number to each package. Alternatively you can go here to see all your packages. Inside the details of each package will list the primary domain, price and renewal date set for that package. Use this as a reference as to which package you want to cancel. Now that you know which HostGator package you wish to cancel, now it’s time to prepare for battle with the Hostgator Live Support Chat people… or at least that is what I was expecting. Surprisingly, this was A VERY EASY PROCESS. 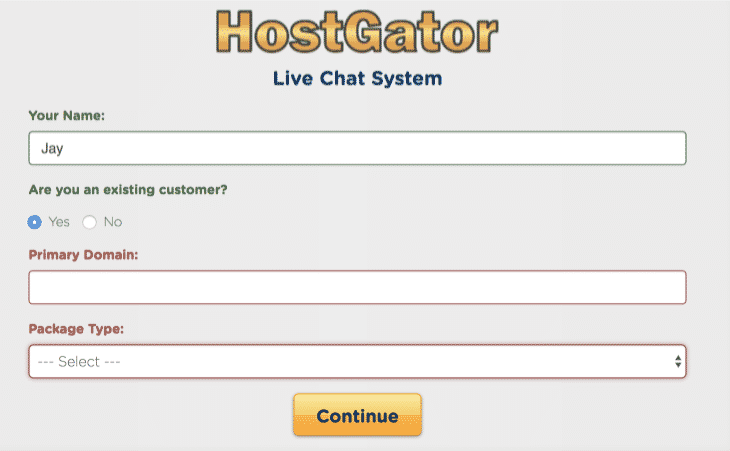 All you need to do is head back to the HostGator Support page and click the LIVE CHAT icon located on the top right of the page. This will pop open a new window prompting you for your name and your customer login. Depending how busy they are, you may get someone helping you right away or within a few minutes. There is an approximate wait time displayed. For me, it was right away. But if you find yourself waiting for a while, just leave the chat window open and ensure you have your speakers turned up as a chime will come in when someone is ready to help you. Now that you have someone ready to help, greet them and say you wish to cancel your hosting package and mention the domain with the associated package ID. From there, they will ask you why you wish to leave, my recommendation is to say you’ve merely merge your stuff with another package and that there is nothing wrong with the service. They may ask you a few more questions, but once everyone is answered – they will process the cancellation and confirm this by opening a support ticket. And that’s it! Seriously… that is all you need to do to cancel your HostGator Package! In some case you may have paid your fees with PayPal which means there is one more step that you need to do. The great thing is if you forget this part, they will remind you within the support ticket. Click on the name of the Merchant of the subscription that you would like cancels (HostGator). Click on Cancel Subscription on the bottom of the page. I was seriously surprised and impressed as to how easy it was cancelling my HostGator package. Mind you, I have never had any negative experience with HostGator’s service or support. 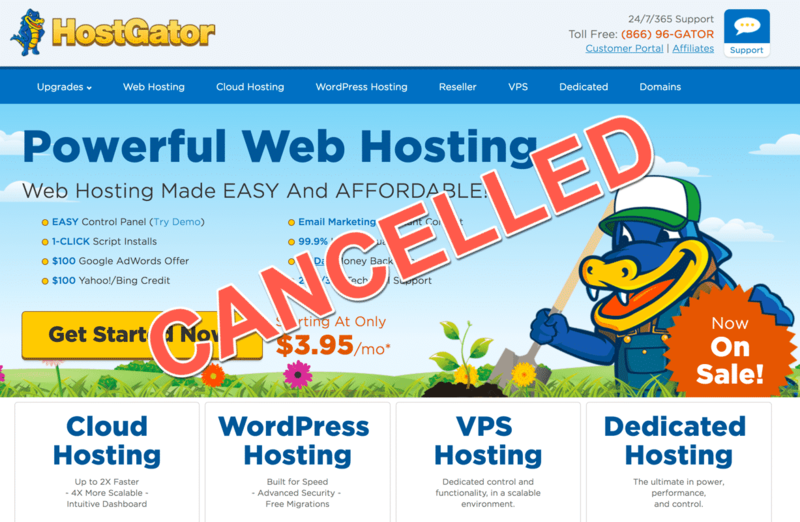 If you have a old hosting package in HostGator that you have been putting off, go ahead and cancel it as it will be much easier than you think! Really helpful post on how to cancel a hostgator package Jay. I especially liked the way you demonstrated each step with screenshots and everything. I hate those tutorials that tell you how to do something but don’t take care of the visual part of the process. I’m visual in nature so I really need thos images tohelp me get it better. Thanks again! Thanks for the help! After a few failed attempts at creating my own website, I finally joined WA, with the hosting there, I no longer needed my HostGator account. To tell the truth I hadn’t even thought about it, so I have paid for a few months that I did not need to. That is until I came across your page. I just finished closing the account and want to say Thanks! Hi thanks for the article. My package is cancelled now. But you know how to cancel the Hostgator Billing Portal? Is still active!!! Thanks for your post on this. I didn’t realize that it was that complicated to cancel hosting packages (such as HostGator) so thanks for sharing. Also happy to say I’m on Wealthy Affiliate for my hosting and have had no issues as well as really great support when I’ve asked questions. Keep up the good work! Thanks a lot for the amazing tutorial, i have one question though, i want to cancel the hosting plan but keep the domain name active. Is it possible or i need to migrate the domain name to the ne hosting company?